So here we are with another polish from Barry and his M, with a subtle homage to Lynderella. 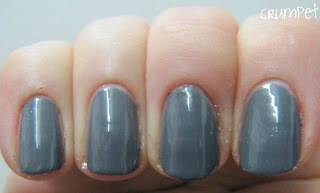 Barry M’s grey is a medium grey. 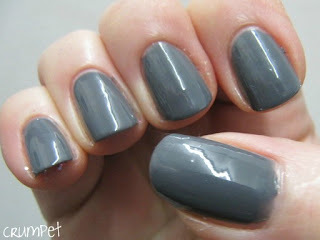 It reminds me a lot of Zoya Kelly, but only in as much as that they have the same base tonality. Essentially, this is Kelly without the lovely blurple undertones. So this is darker than a dove, but lighter than charcoal. It’s really the colour of pure industrial smoke – thick and dirty. 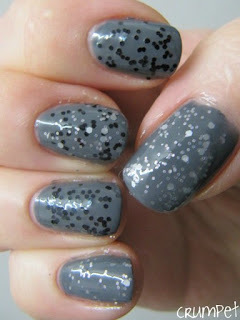 This is opaque in 2 coats and goes on super easy. 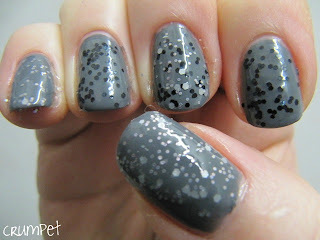 I decided to play with my beloved Tangled In My Web again, and my new Nubar White Polka Dot. I am LOVING how the middle finger turned out with a coat of each – pretty much like the closest thing some of us will get to Lynderella’s Connect The Dots lol.